In recent years, we’ve seen the rise of micro-publishing in the book world… small press companies that can give a break to aspiring writers or those who are not part of the mainstream publishing world. Sometimes the result of this new kind of publishing freedom can be appalling…and sometimes it can be truly revelatory, shining a light on some talents who would otherwise be obscure. Gary Hill, the mastermind of the Music Street Journal website, is starting to dabble in weird fiction using the small press route. I want to say right here that I have the pleasure of working with Gary on the MSJ website, so be aware of that connection. But I will try to look at this new anthology of weird fiction entitled “Dark Dreams and Weird Worlds” with an objective and unsentimental eye. This is a slim volume and a pretty quick read. It collects stories by Hill himself and eight other authors of varying experience. Some like Kurt Belcher and Ken Lateer are fairly well known in the independent comics world. Others are new to the game. All try their hand at writing with enthusiasm, but sometimes iffy execution. There’s no one over-arching theme that unites the stories here other than they are imaginative fiction. Some are very SF in approach, others are straight up horror and dark fantasy. One thing that does unite many of them is that the stories are pretty downbeat. You won’t finish a lot of these stories with a chuckle and a grin (unless you’re really off the grid mentally). That sometimes makes for tough sledding but given the state of our society today, perhaps this is more than forgivable. One thing that really emphasizes the amateur nature of this anthology is the frequent and very obvious lapses in editing. Not so much in terms of idea, but more the nuts and bolts aspects like numerous typos and gaping holes in typography where blank spaces yawn like canyons in the text. Some typos are going to happen at this level, but there are times when they reach annoying levels. Bill Camp’s story “The Sorcerer” is especially undercut by frequent gaps in the text and obvious typos. This is something that really needs to be attended to in future endeavors. But the meat of any book is in its ideas and atmosphere and “Dark Dreams & Weird Worlds” is much more successful in this area. There are some pretty novel ideas contained in this volume and even concepts that are well worn get a twist that makes things interesting. I’ll look at Gary Hill’s own stories first. “Altered Reality” is a short story about criminals taking advantage of alternate worlds and the police force tasked with bringing them down. It has a noirish, hard boiled feel to it. The story is really too short to deal with all the ideas it brings up, but there’s some meat here to pursue in further stories or even maybe a full length book. “The Stars” is an all out space opera of alien invasion that takes a sharp turn into Lovecraft territory late in the tale. I like the concepts here, but the phrase “the thing is” appears with distressing familiarity for such a short tale. “Torment” is a really gloomy paranoid tale about people believing they are pursued by demonic creatures. The ending is somewhat predictable but the atmosphere is oppressive throughout. Hill’s last contribution “Wizard Song Prologue” is a real head scratcher and makes me wonder at its inclusion here. Is it really a snippet for a fuller story? I hope so, because if this is all there is, it’s kind of a dud. The main concept behind it is a very well worn one that was explored by “The Twilight Zone” in the episodes “Third From The Sun” and “Probe 7, Over and Out”. I don’t know what to make of it but if it’s a complete story, it’s not too satisfying. Mark Matzeder contributes 2 stories with nasty stings in their tail. “Silver Spoon” is especially disturbing and I don’t imagine advocates for the homeless or mentally ill will be too thrilled about it but it packs a punch you will not soon forget. “Dressed To Kill” spins a story about the dangerous fashions of the future that is a commentary on consumerism and “looking good”. Heath Alberts contributes four stories to the book, the most of any author. These tales often read like a doubting Catholic having an internal debate with himself, especially “Playing God”. “Know It All” relates the melancholy story of a young subject of genetic experiments trying to deal with knowledge beyond his years while “What’s For Dinner?” is an amusing sci-fi fable. “Some Day” deals with immortality and has more of that obvious Catholic monologue, but it examines immortality on a truly huge scale that will make you think. I certainly would not want to be the protagonist of this one! Bill Camp is an author that is personally known to me. His three stories here are admirably distinct from each other and show some range. “Shadows In the Corner” is a brief, gloomy story where you can guess the ending rather easily. Nevertheless, it’s a chilling tale because someday we all must face the same fate as the old Marine. “Paranormal Experiment” has a lighter tone, which is rare for this anthology, and looks at a paranormal scientist who has an unusual affair with the ghost he is studying. This tale shows there is not only life after death, but hanky panky, too! “The Sorcerer” is a period piece that takes a stab at doing a Poe type of story. It falls victim to the typos I spoke of earlier, but seems clunky in how it unfolds. The oddly named “Life At The Speed of Dogs” is courtesy of Ian Christopher Leblanc and is one of the longer stories here. It tells of life on an orbiting satellite and some of the pitfalls therein. This gloomy story has a lot of well thought out detail of life in space but doesn’t paint too cheerful a picture of that life. It’s one of the most realistic offerings here. Henrik Sandbeck Harksen from Denmark contributes another dark and depressing story of the future with “The Doll and The Dead”. It spins a Matrix-inspired yarn of a false reality keeping society in check. This one is especially harsh and definitely not for the kiddies. Despite the Matrix connection, the story is unnerving because our society is headed down the road described here. A very dystopian vision. “The Destroyer of Worlds” by Dustin Urness takes two of the biggest SF clichés…an apocalyptic plague and an alien invasion…and manages to create something haunting and wistful. A fast acting plague from outer space has destroyed humanity. The last human survivor manages to have a conversation with the alien invader who created the plague. There is something so melancholy and moving about this talk that it will stick in your memory the way it has in mine. The highlight of the anthology is the utterly weird and wacky “Wondermat” by Ken Lateer. The slice of surreal strangeness describes a very unorthodox laundromat and the bizarre characters who frequent it. Lateer’s imaginative descriptions of the Wondermat and the odd beings who make use of it are wonderfully off the wall and a little ominous as well. I highly recommend this story if you like the surreal fantasy of China Mieville and similar authors. The last original contribution is “They Gave Me The Duke’s Hands” by Kurt Belcher. This one drops the names of so many comic industry bigwigs it isn’t funny. An obsessed comic nerd tries to find out why his favorite artist’s hands are always gloved and learns the awful truth. Although using a pseudonym, the weird creature behind the secret of the hands is obviously based on comics legend Jack Kirby. All the comic references will be great if you’re the type who wears BAZINGA on a T-shirt, but those who are not so knowledgeable will be left scratching their heads. The story is also hurt by the fact none of the characters are likeable in the least. 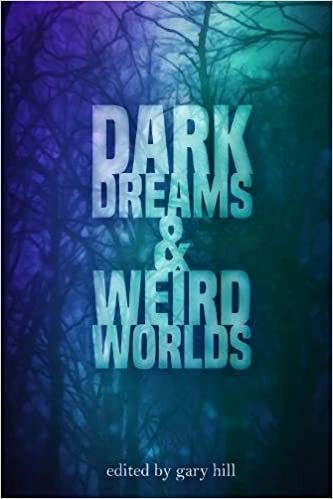 “Dark Dreams and Weird Worlds” is an interesting anthology of dark fantasy and SF that has some fairly obvious pitfalls, but on the whole, it delivers solid entertainment and showcases some authors who have a real love for what they’re doing. I hope we hear more from all of them.